Secret tracking using GPS may be simple, undetectable and cheap — but appeals courts can’t decide if it’s constitutional. In 1791, when the Fourth Amendment to the United States Constitution was ratified, it certainly seemed specific enough for the needs of the time. The new Americans were tired of colonial powers freely searching and seizing, with general warrants that were as full of holes as Swiss cheese. The Founding Fathers said authorities must leave well enough alone or get a specific warrant detailing exactly what they expected to find and where they expected to find it. They weren’t allowed to beat down a citizen’s door on a whim, but instead needed to present evidence of “probable cause” to a judge who decided whether to allow a search. Since then, case after case have helped define the limits of search and seizure, the detail necessary on search warrants, and where and when a U.S. resident can expect privacy. With thermal imaging, wireless, satellite photos and satellite positioning, navigation and timing technology, and smart phones and other mobile devices, invasion of privacy is now a lot less personal — and a lot less detectable — than it used to be. Privacy concerns have already been raised regarding GPS-enabled social-networking tools like Facebook Places or FourSquare, or visualization and navigation-related services such as Google Earth or MapQuest. And anxiety about being tracked — whether by a suspicious spouse or the FBI or a public toll-road authority monitoring payments—may lead some citizens to consider buying a GPS jammer, which could lead to widespread problems of its own. These concerns are showing up in an increasing number of federal appeals court cases around the country in which GPS or other tracking technologies are playing a role. On September 7, the U.S. Third Circuit Court of Appeals sitting in Philadelphia, Pennsylvania, ruled that the FBI and other police agencies don’t need a search warrant to track the locations of Americans’ cell phones. The three-judge panel overruled a lower court decision that denied a Justice Department attempt to obtain stored location data in a drug-trafficking investigation without a search warrant, saying federal privacy law prohibited it. Instead, the appellate court said tracking cell phones "does not require the traditional probable-cause determination" enshrined in the Fourth Amendment. The court thus supported the Obama administration’s argument that warrantless tracking is permissible because Americans do not have a "reasonable expectation of privacy" in the location of their cell phones. Federal lawyers contended in the case that "a customer’s Fourth Amendment rights are not violated when the phone company reveals to the government its own records” that show where a mobile device placed and received calls. The court’s decision, however, left the issue unresolved because it focused on which federal privacy statutes apply. Indeed, the appellate judges noted that, in at least some cases, investigators may be required to obtain a search warrant, but that it was, "an option to be used sparingly." “In the United States, we are only beginning to discuss what a reasonable expectation of privacy actually means from a spatial technology standpoint,” said Kevin D. Pomfret, a Richmond, Virginia, attorney whose practice focuses on the rapidly developing fields of spatial law and technology. Kevin Bankston, an attorney with the Electronic Frontier Foundation, agreed. “It is still an open question as to whether the Fourth Amendment applies to cell phone records." 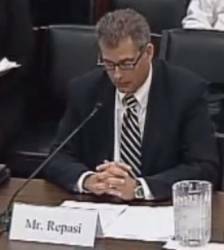 Consequently, companies that invest in and make use of this technology will, for the time being, “be forced to operate in an environment that is rife with uncertainty,” said Pomfret, who is the executive director of the Center for Spatial Law and Policy and a member of the board of directors of the Open Geospatial Consortium. Generally, American court decisions have reaffirmed that your home is still your castle. The castle includes a fenced yard, a patio or other places attached to your house in which you have every right to think you will not be watched or overheard. But. . . is your yard unfenced and adjacent to an open field? Maybe not. Does your open driveway have a "No Trespassing" sign out front? If not, it may be fair game. And, don’t look now — but the airspace above your house isn’t private, either. "expectation of privacy," according to established case law. Information gathered from the outside of your car — the license plate, for example — does not require a warrant. Court decisions have broadened police powers in these cases and addressed the use of technology. But technology changes so fast, the law is still trying to catch up. With the rapid adoption of vehicle tracking systems that are small, accurate, fast, cheap and easy to use, law enforcement agencies at all levels are using GPS-aided units for secret monitoring of suspects. Recently, two cases made it all the way up to U.S. Circuit Courts in Washington, D.C., and California. Both cases involved secret, long-term GPS vehicle surveillance of suspected drug dealers. Each court decided differently. In 2005, a Washington, D.C., nightclub owner named Antoine Jones was arrested by the Metropolitan Police Department and charged with conspiracy to distribute cocaine, among other things.At trial, the jury couldn’t agree and the judge declared a mistrial. Originally, police had obtained a warrant to attach a vehicle-tracking device to Antoine’s car. The warrant expired and the police attached it again in violation of a court order by the U.S District Court in Washington. Prosecutors argued that Antoine was driving on public highways and, thus, the police did not need a warrant. However, a three-judge panel from the U.S. Court of Appeals for the Tenth Circuit in Washington, D.C., said "not so fast." The U.S. Department of Justice challenged that decision and asked the full court to reconsider it. In November, the appeals court judges voted, 5 to 4, against reopening the case. Does Your Home Need Patrols and Motion Sensors? In 2007, The Drug Enforcement Administration (DEA) had investigated a Medford, Oregon, man named Juan Pineda-Moreno for alleged large-scale marijuana growing. On seven separate occasions, they placed small GPS devices that attached by a magnet to the underside of his car. Sometimes they observed his movements remotely; sometimes they had to retrieve the device. On two occasions, according to court records, they sneaked up the driveway of his trailer home at night to attach the devices. Eventually, DEA agents and immigration agents caught him and his companions with bags of marijuana, and he was indicted for violating federal narcotics laws. Pineda-Moreno appealed. The car was parked in the driveway right next to his house, where he had every expectation of privacy. The court denied his appeal. They agreed that the driveway was part of his home ("curtilage" in legal terminology) but was semi-public because there were no barriers and a paperboy or a neighborhood child retrieving a lost ball could walk freely up the driveway. Chief Judge Alex Kozinski disagreed strongly, saying in that case privacy rights would only apply to those who could afford "electric gates, tall fences, security booths, remote cameras, motion sensors and roving patrols." The thorny debate rages on in New York and Wisconsin courts as well. It looks like GPS technology and the Fourth Amendment are still miles apart and will eventually end up in the same location: the United States Supreme Court. This is an updated version of an article that first appeared in the Fall 2010 issue of the Institute of Navigation newsletter.